The Buffalo Bills couldn’t have asked for a more ideal outcome in their 21-12 win over the New York Jets at New Era Field or could they? This win was a perfect beginning for the regime of Head Coach Sean McDermott and General Manager Brandon Beane. The first win for a new Head Coach or General Manager will be something they remember for the rest of their lives. For the most part, the Bills played good football. They only had one turnover and that was on the opening drive. The finished the game by holding the Jets to 214 total yards of offense while gaining 408. They created two turnovers, both interceptions, winning the turnover battle two to one. Any time a team wins the turnover battle they generally come out on top. Holding the Jets to just 38 total rushing yards and 2.5 yards per carry is something to be proud of, as both numbers are excellent. Shady McCoy ran for 110 yards and averaged 5.0 yards per carry. He also had five receptions for an additional 49 yards. New running back Mike Tolbert is the perfect complement to McCoy with his battering ram style. Tolbert gained 42 yards on 12 carries and added a touchdown. Charles Clay looks as if he’ll have a big season. Leading the Bills with four receptions and a touchdown is a good start. The Bills seemed in control of this game from the start and at no time did I feel the outcome was going to be any different. The offense has to do a much better job finishing drives. The opening drive was perfect until the first and goal from the two yard line. They went backwards from there and then Taylor was off target on a throw to Charles Clay, causing an interception. They also missed an easy 43 yard field goal attempt when Stephen Haushka hooked his kick. Winning teams do not make these type mistakes and throw away opportunities. While the Jets only threw for 214 yards, Josh McCown completed 26 of 30 throws. That percentage is too high and too often the underneath receivers were given too much cushion. As much as the Jets threw the ball, the Bill were only able to get one sack, and that was by a safety. The line was shut out. Going forward, the defensive line has to find a way to put more pressure on the opposing quarterback. The Bills won this game by nine points. It really wasn’t that close. They have to figure out a way to put more points on the board. The starting wide receivers caught a total of three passes. 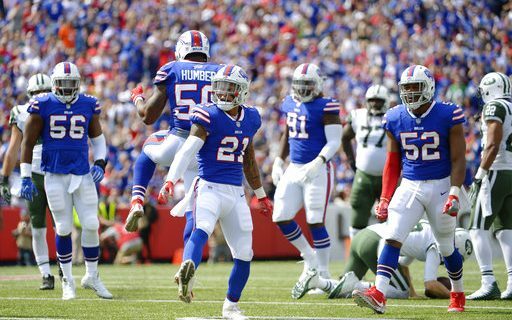 The Bills need to find a way to get them the ball more often, as they are a talented group. On paper Tyrod Taylor looked to have a good game. Reality is, he was average. As I stated above, the Bills starting wide outs caught only three balls. Part of the reason is Taylor can struggle when in the pocket. He doesn’t see the field that well and being a short quarterback doesn’t help. His accuracy from the pocket is below average. I liked how the Bills used a lot of play action and those types of plays will help his overall accuracy and production. A win is nice, especially on the opener, but let’s be honest, the Bills played one of the worst teams in football. Next week they travel to Carolina and face a legitimate playoff contender. In order to win that game, they have to be better in all phases of the game. All told, this Bills team is a work in progress. I like how they played the game with enthusiasm and aggressiveness. Still the overall talent of this team needs to improve and that will take time. What will help is the younger players should improve as they gain experience. It’s great to start off 1-0, but lets not get to excited yet. There are 15 more games to be played.